Religion and spirituality invite us to embrace the widest possible view of human evolution. Using a Sufi model, we will explore the four levels of religion and the many paradoxes of the spiritual journey. How are spirituality and religion related; what is their purpose? In this session we discuss how every religion invites us to recognize our limitations, yet embrace the widest possible view of human evolution. Religions offer an aspirational paradigm for humanity and practical tools to assist us on our spiritual journey. Using a Sufi model, we will explore the four levels of religion and the paradoxes of the spiritual path: knowledge and inspiration, effort and surrender, action and contemplation. The intention is to remind us of the essential part we play in the evolution of human consciousness. Roland Evans was born in Ireland and attended the Universities of Edinburgh and Pennsylvania before completing his training as a clinical psychologist in London in 1983. He worked as a UK psychologist for 10 years and, after coming to the US, taught courses at Naropa University over a period of 16 years. 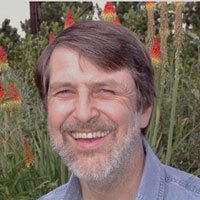 Roland has a private practice as a psychotherapist but is also an avid gardener, wood-turner and writer. He has been member of Subud—a spiritual practice centered on surrender—since 1970. Roland is the author of Seeking Wholeness (2001), and is currently working on A Course in Marriage: Transforming Intimate Relationships. If I lived in Boulder, I would gave come–I hope it was a fruitful evening for everyone.